We specialise in: Wedding cakes, Birthday cakes, Party cakes & all other celebration cakes. We offer a range of sizes and tiers as well as cupcakes and mini cakes. A variety of cake flavours and fillings available, including a selection of eggless cakes. 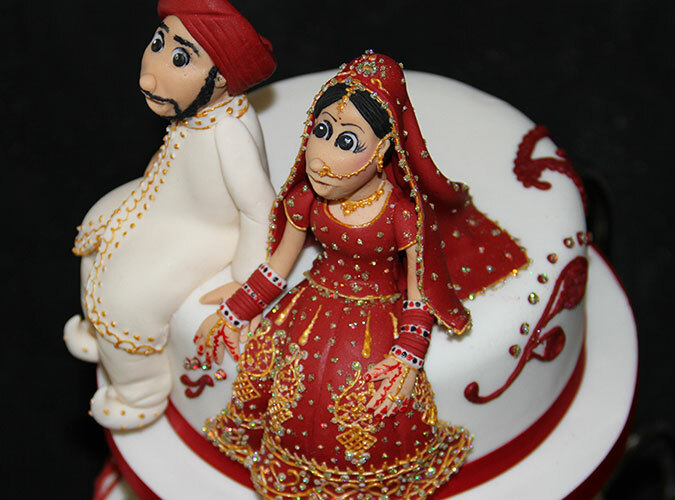 In addition to this the option of personalised cake toppers is available to make any cake truly unique. At Cake-A-Tier we aspire to create cakes that are a piece of art, a centrepiece for any occasion. What's more our cakes are a scrumptious treat making any celebration magical. We offer a bespoke service so if you have a vision of the cake you want, we will work with you to turn your dream into reality. Of course if you are stuck for ideas then we have plenty of them to share with you too. So if you are looking for a contemporary design or a classically themed cake you can count on Cake-A-Tier to deliver. We're based in Hayes, Middlesex, ideally located to deliver throughout London and The Home Counties.